Every season, I always try to buy a few classic wardrobe pieces that I can wear for many years to come. Don't get me wrong, I get distracted often by those fun and slightly impractical pieces, but slowly I have built up a nice selection of staples. My newest addition is this black fedora. I haven't always been a hat person, but over the past few years my affinity for them has grown (as has my collection). 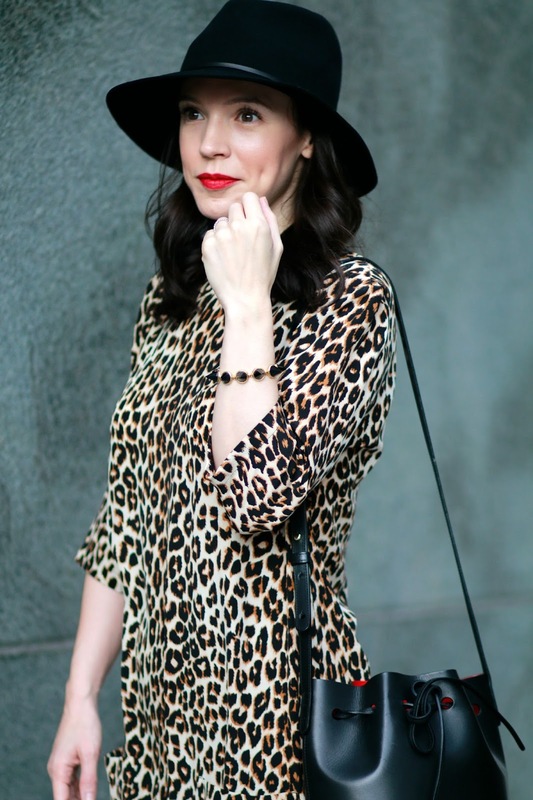 My leopard print dress is a favorite of mine that I have worn on the blog many times and I wear it year round with sandals, boots and here with oxfords. I knew the moment I purchased this dress that it would end up being a classic piece that I can dress up or down, and wear during any season (see it here and here). The bag and shoes were both splurges at the time, but if you look back here, here, here, here and here (and probably more but you get my drift), you can see that they have made the rounds and will continue to do so all season long. A few more staples that are on my list for fall - a white chunky sweater (love this one too), a new pair of dark skinny jeans (and these are great for a distressed option), ankle boots (black or brown - decisions!) and a larger than life scarf (this one is under $15 - eek!). What are some of your favorite wardrobe staples? !